This textbook is suitable for the following courses: Introduction to Information Systems, Strategic Information Systems, Capstone Information Systems course, Technology Entrepreneurship, Digital Organization/Digital Leadership, Management Information, and Information Technology. This well-respected textbook offers a proven approach that consistently garners student praise and faculty approval. 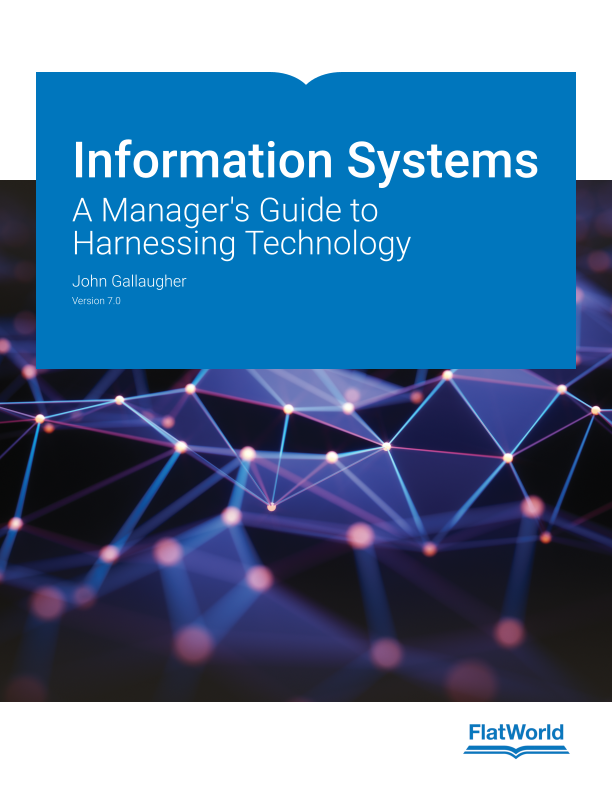 Initially inspired by his dissatisfaction with out-of-date information systems textbooks, John Gallaugher set out to create a textbook that was as engaging and current as the best popular press tech articles. In addition to being updated annually, the book conveys durable knowledge about how business systems can enhance employees’ effectiveness, contribute to a company’s efficiency, and add to a firm’s overall value. Information Systems: A Manager’s Guide to Harnessing Technology also features a wealth of cases based on contemporary companies that engages students and excites them about the increasingly important role of tech plays in professional and corporate success..
3.2 Don’t Guess, Gather Data—Make Small Batches Of What Customers Want & Ship It Fast! 5.2 The Death Of Moore’s Law? 6.2 From Bitcoin To Blockchain And Beyond: A Disruptive Innovation For Money And More? 8.2 Platforms Are Powerful, But Where Does All That Value Come From? 8.3 One Sided Or Two Sided Markets? 8.4 How Are These Markets Different? 10.4 Airbnb—Hey Stranger, Why Don’t You Stay At My Place? 12.2 Founding The Business: Are We On To Something? 14.7 Software In The Cloud: Why Buy When You Can Rent? 15.3 Where Does Data Come From? 15.7 Artificial Intelligence, Big Data And Machine Learning: It’s Now Everywhere! 17.2 Why Is This Happening? Who Is Doing It? And What’s Their Motivation? John Gallaugher is an associate professor of information systems (IS) at Boston College’s Carroll School of Management. As founding faculty for the Boston College TechTrek programs, and the former colead of the school’s graduate field studies in Europe and Asia, Professor Gallaugher has had remarkable access studying technology growth and impact worldwide. Professor Gallaugher and his students spend several weeks each year visiting with technology executives, entrepreneurs, and venture capitalists in San Francisco, Silicon Valley, Seattle, Boston, New York, and Ghana. Gallaugher and his students were present at the launch of the iPhone, were at Sequoia Capital the day LinkedIn went public, and are regularly hosted in master-class sessions at firms from Amazon to Zynga. This unique opportunity helps provide his teaching and writing with a broad, deep, and continually refreshed perspective on key industry trends and developments. Gallaugher also works closely with collegiate entrepreneurs and is coadvisor to the Boston College Venture Competition, an organization whose affiliated businesses have gone on to gain admittance to elite accelerator programs (Y-Combinator, TechStars, MassChallenge, Summer@Highland), launch multiple products, and raise millions in capital. A dedicated teacher and active researcher, Professor Gallaugher has been recognized for excellence and innovation in teaching by several organizations, including Boston College, BusinessWeek, Entrepreneur Magazine, and the Decision Sciences Institute. Professor Gallaugher’s research has been published in the Harvard Business Review, MIS Quarterly, and other leading IS journals. Professor Gallaugher has been a featured speaker at Apple Inc’s AcademiX educator conference, and was the international keynote speaker at AIBUMA (the African International Business and Management Conference) in Nairobi Kenya. He has consulted for and taught executive seminars for several organizations, including Accenture, Alcoa, Duke Corporate Education, ING, Partners Healthcare, Staples, State Street, the University of Ulster, and the U.S. Information Agency. His comments on business and technology have appeared in the New York Times, National Public Radio, BusinessWeek, the Boston Globe, Wired, the Associated Press, Chronicle (WCVB-TV), The Daily Yomiuri (Japan), and the Nation (Thailand), among others. Professor Gallaugher publishes additional content related to his teaching and research at http://gallaugher.com. He is also active on Twitter at @gallaugher.